In New Orleans, A Health Clinic For Working Musicians : The Record In the weeks surrounding the city's annual Jazz Fest, the New Orleans Musicans' Clinic is flooded with artists who lack health care and can't afford to lose work over strep throat or a broken finger. The Stooges Brass Band performs during the 2012 New Orleans Jazz & Heritage Festival. 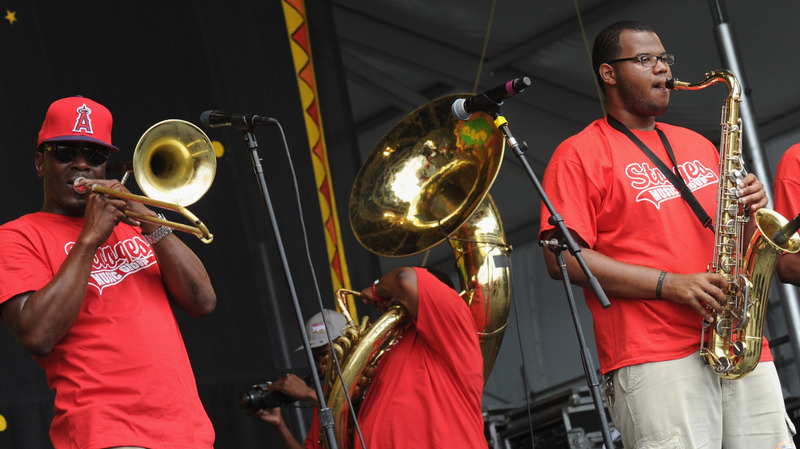 The annual New Orleans Jazz & Heritage Festival is in full swing until Sunday. The event draws hundreds of thousands of visitors from around the world — and also working musicians playing the festival. Many of the performers don't have health insurance, so when they need a tuneup, they get care from the New Orleans Musicians' Clinic. It's one of a few health centers in the country that provide care exclusively to artists. The clinic is really just two exam rooms and a couple of offices within Louisiana State University's medical school. But through grants and donations, and with the support of the larger hospital, the facility helps 2,400 New Orleans musicians with everything from the flu to slipped discs to, well, work-related injuries. Charles Moore has been playing the bass for 43 years, but he hasn't played the upright in a long time until now. "Now I got a blood blister from playing too hard," Moore says. "I play hard. And I got a big blood blister on my finger and it hurts!" Moore, who is slated to perform this weekend at Jazz Fest, also has the flu. Musicians coming in before a gig isn't uncommon — a drummer will have gout in a toe and need an injection, for example. Clinic director Bethany Bultman says that while musicians might come in to address a blister, the clinic uses that opportunity to address diabetes prevention or exercise. In other words, music is the opening that helps the clinic treat the whole patient. "If their arthritis is becoming a barrier not to their wellness, but a barrier to them doing what they love to do, they will come in," Bultman says. Dale Spalding, who sings and plays guitar, drums and harmonica, was more proactive than that: He made an appointment to talk about back pain before heading out on the road. But he says he still likes to think of his health holistically. "Musicians play in pain all the time," Spalding says. "If you have a gig, you go to the gig. You do it. And most of his time, just playing the music cures you temporarily."